Superficial muscles o the chest an front o the airm. Clavicular heid: anterior surface o the medial hauf o the clavicle. 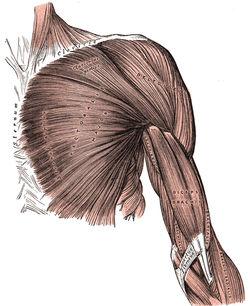 As a hale, adducts an medially rotates the humerus. It an aa draws the scapula anteriorly an inferiorly. The pectoralis major (frae Laitin: pectus, breast) is a thick, fan-shaped muscle, situatoy at the chest (anterior) o the human bouk. This page wis last eeditit on 20 Januar 2018, at 21:11.